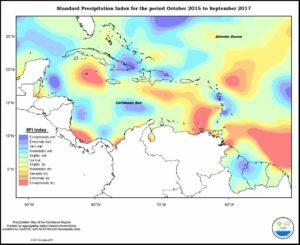 Normal to above normal rainfall was experienced over the islands of the eastern Caribbean for September 2017. 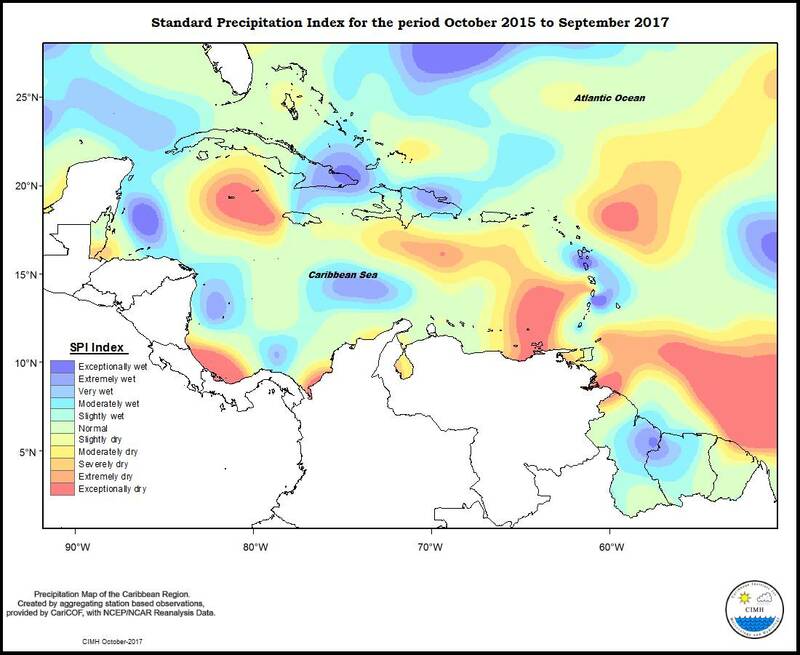 Trinidad, Tobago, St. Vincent, and St. Lucia were normal; Grenada slightly wet; Barbados very to extremely wet from south to north; Martinique slight to moderately wet; Dominica and Guadeloupe exceptionally wet; Antigua moderately wet; and St. Kitts very wet. Conditions in the Guianas ranged from moderately dry in the north to extremely wet in southern Suriname and western Guyana. Aruba and Curacao were normal. Conditions in Hispaniola ranged from slight to moderately dry in southern Haiti to exceptionally wet in most of the Dominican Republic; while Jamaica ranged from extremely wet in central areas to severely dry in the west. Grand Cayman was normal. Western Cuba was slightly dry to slightly wet, and eastern areas normal to exceptionally wet. Belize ranged from exceptionally dry in central areas to moderately dry in the south and moderately wet in the north. Apart from Trinidad that was slightly wet to moderately dry, the islands of the eastern Caribbean experienced normal to above normal rainfall for the three month period. 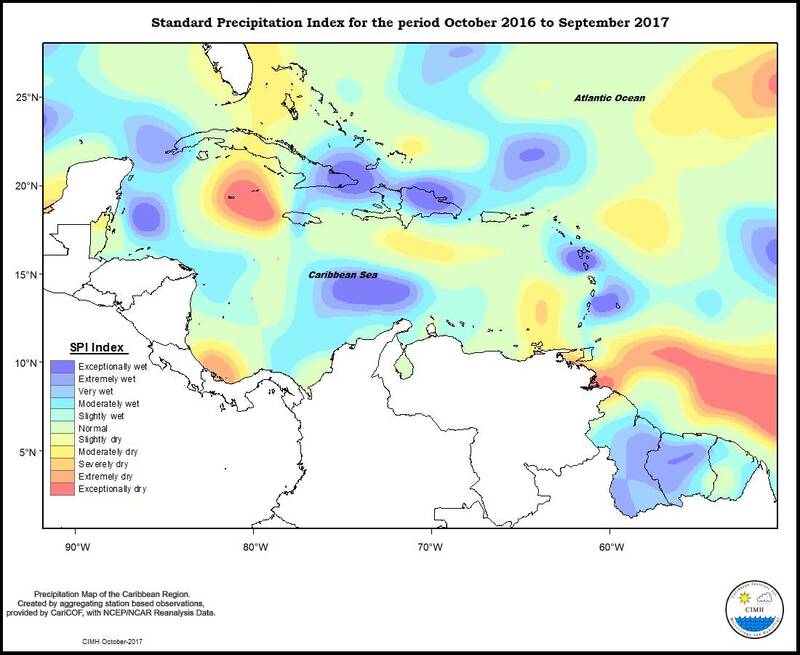 Tobago, Grenada, St. Vincent, St. Lucia and Martinique were normal; Barbados and Dominica moderate to extremely wet; Guadeloupe extreme to exceptionally wet; Antigua slightly wet; and St. Kitts very wet. Conditions in the Guianas ranged from moderately dry to exceptionally wet in central areas of Guyana to the west into western Suriname. Both Aruba and Curacao were normal. 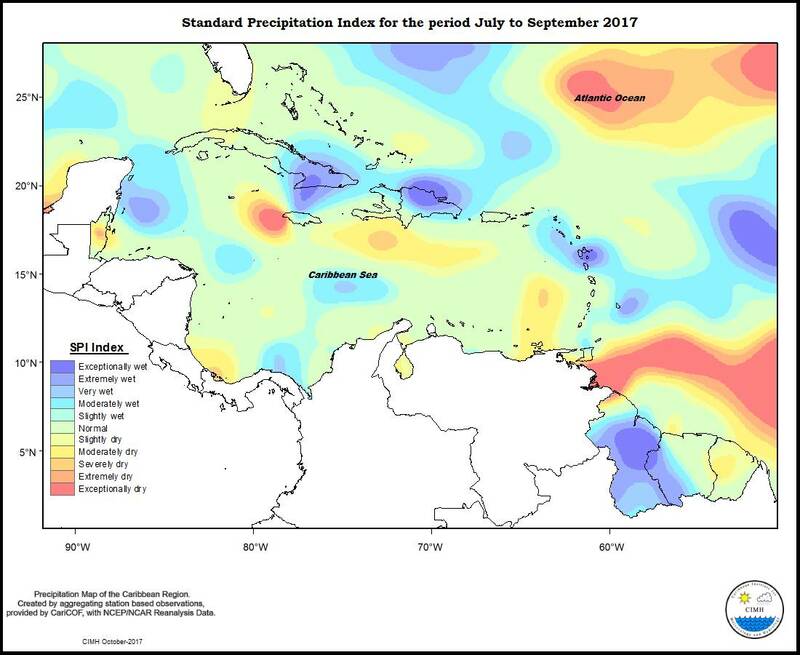 Conditions in Hispaniola ranged from normal in the southwest to exceptionally wet northern Dominican Republic; while Jamaica was moderately wet in central areas to extremely dry in the west. Grand Cayman was normal. Western Cuba was slightly dry to slightly wet, and eastern areas normal to exceptionally wet. In Belize, conditions ranged from exceptionally dry in central areas to normal to the north and south. 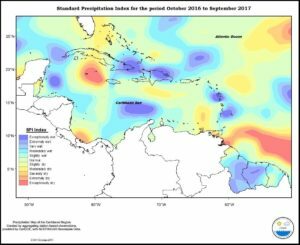 For the six month period, apart from Tobago that was normal to moderately dry, the eastern Caribbean islands had normal to above normal rainfall. Trinidad was normal to moderately wet; Grenada, Barbados and Antigua moderately wet; St. Vincent slight to moderately wet; St. Lucia and Martinique normal; Dominica moderate to exceptionally wet; Guadeloupe exceptionally wet; and St. Kitts extremely wet. Conditions in the Guianas ranged from moderately dry in the north of Guyana to exceptionally wet in northwest Guyana into northwestern Suriname. Aruba and Curacao were normal. Conditions in Hispaniola ranged from moderately dry in the southwest to very wet in northern Dominican Republic; while Jamaica was exceptionally wet in central areas to moderately dry in the west. Grand Cayman was moderately dry. Cuba ranged from normal in central areas to extremely wet in the west and exceptionally wet in the southeast. Belize was normal to moderately dry. 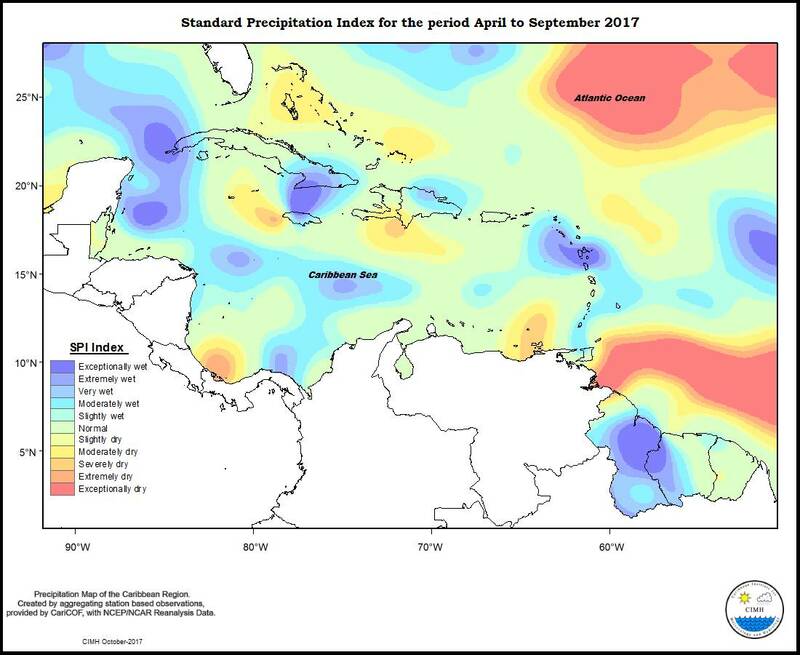 Apart from Trinidad that was moderately dry to moderately wet, rainfall for the twelve month period in the islands of the eastern Caribbean was normal to above normal. Tobago and Antigua were normal; Grenada slightly wet; Barbados extreme to exceptionally wet; St. Vincent extremely wet; St. Lucia from normal in the north to extremely wet in the south; Martinique normal to slightly wet; Dominica exceptionally wet; Guadeloupe extreme to exceptionally wet; and St. Kitts moderately wet. Conditions in the Guianas ranged from moderately dry in northern Guyana to exceptionally wet in central Suriname. Aruba was normal but Curacao slightly wet. 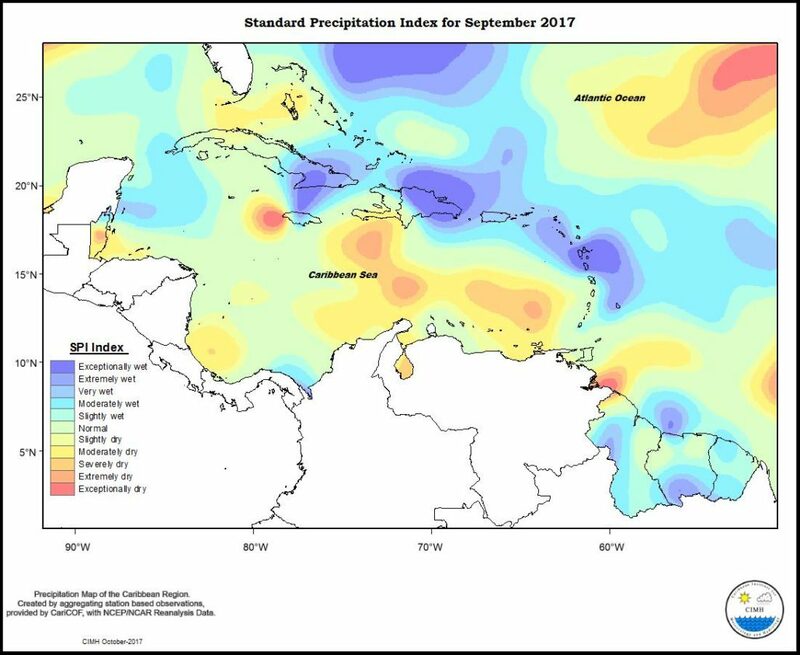 Conditions in Hispaniola ranged from normal in the southwest to exceptionally wet in northern Dominican Republic; while Jamaica was from very wet in central areas to moderately dry in the west. Grand Cayman was exceptionally dry. In Cuba, conditions were from moderately dry in central regions to very wet in the west and exceptionally wet in the east. Belize was normal in the south to moderately dry in the north. The maps produced used SPI values calculated from monthly rainfall totals from land stations and NCEP/NCAR reanalysis data. Only land station data is used for the eastern Caribbean, described here as from Georgetown, Guyana in the south to Anguilla in the north. The Greater (and Western) Antilles is less represented by land stations. However efforts are being made to include more land stations from that part of the region. Note that the severity implied by the index is relative to what is normal for that period of consideration. Normal in the drier season reflects less rainfall than in the wetter season.